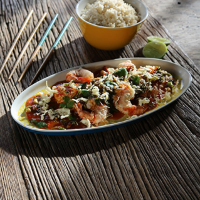 This is a version of the Northern Chinese dish Guō Bāo Ròu, which coats the prawns in potato flour, before layering on a sweet and sour paste which is absorbed by the coating to make a deliciously sweet and sour crispy coating. 1. Combine all the ingredients for the sauce with 200 ml hot water in a heatproof jug and set aside. 2. For the prawns: put the egg, cornflour and about 1-2 tablespoons of water into a bowl and mix to make a batter. 3. Heat the groundnut oil in a wok set over a high heat. Dip each prawn into the batter, and fry in the hot oil until golden – it’s best to do this in batches. Drain on absorbent kitchen paper. 5. Heat a small wok or pan over a high heat and when hot add the peppercorns and toast for 1 minute, crush in a pestle and mortar. Add 1 tbsp oil to the pan. As soon as the oil starts to smoke, add the Sichuan peppercorns, garlic, ginger and chillies, stir fry for a few more seconds. 6. Add the sauce you made earlier to the stir-fry pan and bring to the boil. Stir in the lime juice, salad onions and coriander and remove from the heat and coat over the prawns. Serve with rice - egg-fried rice makes a good match.